Today’s Flash Back Friday comes from Episode 102, from August 2012. Jason Hartman interviews returning guest, Devin Foley on the subject of environment versus ecology and the ideology versus reality behind the environmental movement. The term “environmentalism” is a popular word today with a broad meaning. There are many components to environmentalism, such as conservation, ecology, human impact on nature, and maybe lesser known, a philosophical/spiritual component. Devin and Jason talk about the impact large corporations have on the environment, how competition from the little guys cleaning up their waste have pushed corporations to take care of their own pollutants, lack of enforcement of regulations by the government, and the top-down, often selective, bureaucratic management of the EPA. Devin points out that our air is much cleaner today than it would have been in the 1800s and earlier, when nearly every household was burning wood, and later coal, to heat and cook. Advanced technology today has changed things for the better, even though there is still a high level of concern. Jason and Devin also talk about the philosophy of deep ecology and extreme environmentalists that consider humans to be the problem and what these groups are really implying. Devin is co-founder and president of Intellectual Takeout. In his role, he oversees content development and marketing, works with academics and experts to assure quality, and publicly promotes the site. 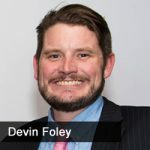 Prior to co-founding Intellectual Takeout, Devin served as the Director of Development at the Center of the American Experiment, a state-based think tank in Minnesota, where he was responsible for meeting a $1 million annual budget. He has roughly eight years of fundraising and policy experience working for candidates and non-profit organizations. Additionally, he has been on 100.3 KTLK as well as Talk of the Nation on NPR and was named a 2011 Young Leader by the American Swiss Foundation. Devin studied history and political science at Hillsdale College in Michigan. There he met his lovely wife; together they have three kids and live in Stillwater, Minnesota. Devin enjoys fast cars, long drives, great books, old planes, and nearly everything life throws his way.